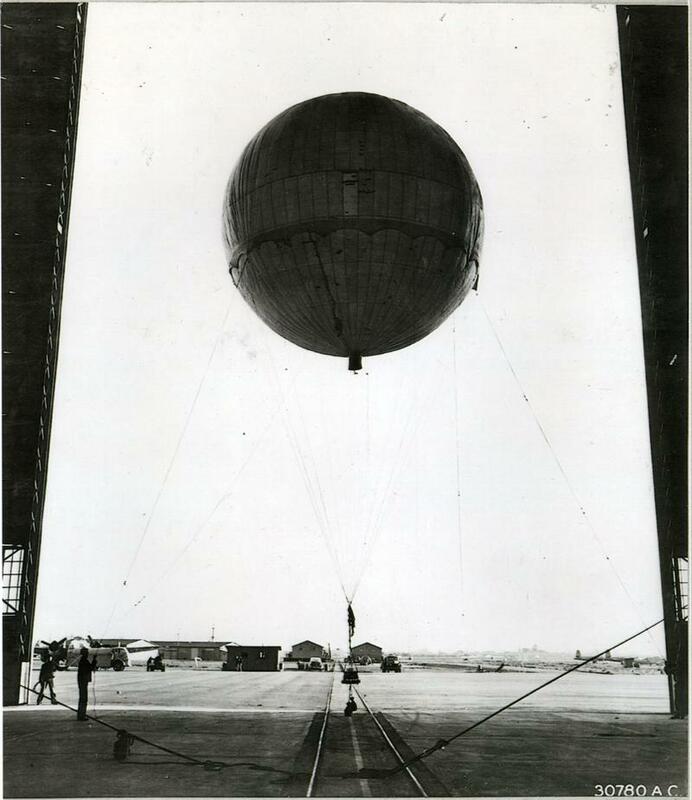 Balloon in hangar: A caption reads: "Overall photograph of Japanese balloon inflated with apparatus properly suspended." Jad Abumrad: Hey, I'm Jad Abumrad. Robert Krulwich: I'm Robert Krulwich. PeterLang-Stant: My name is Peter Lang-Stanton. Nick Farago: My name's Nick Farago. Robert Krulwich: We're gonna get a story from two reporters. Nick Farago: I'm a freelance filmmaker. Nick Farago: Writer slash radio producer. Too many slashes. Jad Abumrad: It's a story that goes back about 70 years. Nick Farago: It all feels unreal in some way. Jad Abumrad: But there's something about this story that just ... you hear it and why can't help but think about now. Nick Farago: I wanna start with, could we got to Thermopolis, Wyoming? Because that was one of the first really well documented landings. Ross Coen: It's the first week of December, 1944. Jad Abumrad: This is Ross Coen, he's a historian and he wrote a book that's pretty much the definitive account of the story you're about to hear. Anyhow, Thermopolis Wyoming, December 1944. Ross Coen: And there were three miners, at a place called the Highline coal mine, which is outside of Thermopolis. They step outside the mine one evening, it's just about dusk, and just as they step out of the mine they hear this whistling sound over their heads. And then a moment later there's a tremendous explosion, and they see this rising cloud of dust about a mile away across the valley. They turn and look, it's dusk, and so in the fading twilight they can't be sure exactly what they're looking at. Nick Farago: But above them there's sort of this fluttering white circle. Nick Farago: They made sense of it by thinking it was a parachutist. Ross Coen: They watched this parachute as it's drifting away from them. They get in their car, and they chase after it, until eventually they lose sight of it in the darkness. Nick Farago: Right around that same time, about 500 miles away in Colorado, a boy and his dad are working in the barn, when they hear an explosion. They run outside and in their yard, there's just this smoldering crater. Ross Coen: In Wyoming, a nine year old boy, playing in his front yard, hears an explosion. Nick Farago: These strange parachute things. Ross Coen: Native residents hear a loud explosion. PeterLang-Stant: Just start appearing in the skies all over America. Nick Farago: Napa, California. Lame Deer, Montana. 20 or so miles from downtown Detroit. PeterLang-Stant: And slipping behind hills. Ross Coen: All of them have different explanations for what they think they're witnessing. They think it's a plan crash. Nick Farago: Or an oil tank exploding. The US military sends out an APB to local police stations, saying, "We need information. What are these things?" Speaker 13: There we go, we fixed it. PeterLang-Stant: Enter Sheriff Warren Hyde. Merion Hyde: My name is Merion Hyde. Merion Hyde: I'm the oldest son of Sheriff Hyde. PeterLang-Stant: We talked to his son. Merion Hyde: He had a presence about him that, he commanded a room. PeterLang-Stant: Sheriff Hyde was a big guy. Merion Hyde: Black wavy hair, broad at the shoulder, narrow at the hips. PeterLang-Stant: Stetson, gun on hip. Nick Farago: And one day, he's at his office north of Salt Lake City, when his phone rings. Merion Hyde: From what I understand, a dry farmer called him. PeterLang-Stant: Said there's this strange contraption in my field. Nick Farago: Some kind of balloon, parachute looking thing floating around. Merion Hyde: So he jumped in the car and went hellbent for leather out into the Blue Creek area. Nick Farago: There's this crazy story where he rushes out to this farm to investigate. Nick Farago: Rips off his belt, with this 38 pistol, because a man can't run with a 38 pistol on his waist. PeterLang-Stant: Here's what he sees in that field. Nick Farago: If you look at a picture of this thing, it's this huge globe. 30 feet in diameter. Merion Hyde: A gust of wind comes by. Nick Farago: Lifts him up, off the ground. Merion Hyde: Like he was a paper doll. Nick Farago: And so he's dangling from the ropes of this thing. The balloons is above him, the explosives are below him. And it takes him across this canyon. And he's holding on, just dangling from it, still trying to wrangle it like some bucking bronco. He lands again, he tries to tie it to a juniper bush or something, but the wind catches it again and goes back over the canyon. Robert Krulwich: Back to the first side? Nick Farago: Back to the first side. Merion Hyde: They started to float around the field. He kept wrestling this balloon for a long time. PeterLang-Stant: He's nauseous from being spun around on this balloon. Nick Farago: His vision's getting blurry. PeterLang-Stant: His hands are becoming raw form the rope. Nick Farago: But he feels this sense of duty. Merion Hyde: He knew the government wanted one of these balloons. Nick Farago: It's his territory, so he gotta take it down. PeterLang-Stant: He finally lets himself free fall, so he can grab it again. Nick Farago: So his weight will jerk the balloon to the ground. Merion Hyde: Then finally, the balloon came down in a little ravine, where sage brush were growing. And a root had been exposed on the side of the ravine from a sage brush. PeterLang-Stant: And he hooks his arm around this root. Merion Hyde: Then he was able to hold the balloon without it being carried into the air. Jad Abumrad: So he actually captured the thing? PeterLang-Stant: Yeah. J. Edgar Hoover wrote him a personal letter of thanks. Ross Coen: They end up shipping all of the evidence off to the Aberdeen military research facility. PeterLang-Stant: Where they had gathered all this different evidence from all over the country. Ross Coen: Apparently this bomb was not of any particular American make, and matched known characteristics of Japanese bombs. Jad Abumrad: So it's Japanese. Nick Farago: But it's impossible to send a balloon across the Pacific Ocean at this point. It's never been done. It's basically an intercontinental ballistic missile. So they're trying to figure out where it's coming from. They thought, maybe they were being launched from submarines. Maybe they were coming from beaches in North America, from saboteurs. Ross Coen: There was even speculation at one point that maybe they were coming from Japanese internment camps in North America. Ross Coen: Two days before Christmas, 1944. Nick Farago: In Alaska, a native Alaskan trapper tracks one down. Ross Coen: And it has two sandbags still attached to the bottom most ring. Nick Farago: And that turns out to be the key to the mystery. Elisa Bergslien: Well, not just sand, there's a lot in there. My name is Elisa Bergslien, and I am a forensic geologist. Nick Farago: We called up Elisa to help us understand this next part. What happened was the sand from the balloons was sent to Washington DC to some scientists at the U.S. geological survey. Ross Coen: They discover that there's no coral. Elisa Bergslien: So finding no coral, you're talking cold water now. Ross Coen: They look at the diatoms. Elisa Bergslien: Put that all together, where would you find these diatoms, these minerals, that you wouldn't find coral, all those different pieces of information. Ross Coen: The geologists are able to determine that there are two or perhaps three beaches, in the world. Elisa Bergslien: That fit all of these qualifications. Ross Coen: Where they believed this sand could've come from. And all of which are on the east coast of Honshu, the largest of Japan's four main islands. Jad Abumrad: You can get that kind of specific from sand? Elisa Bergslien: Yup. That kind of specific. Jad Abumrad: Alright, so they came all the way from these particular beaches on the coast of Japan. Jad Abumrad: That's thousands of miles across the Pacific Oceans. Robert Krulwich: And why would the Japanese choose to deliver bomb payloads by balloon? It's a strange choice. Jad Abumrad: Particularly after Pearl Harbor. We already know they can do planes. Robert Krulwich: Yeah, they got planes. Jad Abumrad: Yeah, why balloons? Speaker 16: Now it can be told, history in the making. Ross Coen: It grew directly out of the Doolittle raid. PeterLang-Stant: Back in April of 1942. Speaker 16: The United States Navy aircraft carrier, Hornet, steams westward across the pacific. PeterLang-Stant: Took off from an aircraft carrier, deep in the western Pacific. Ross Coen: And dropped bombs on Tokyo and Yokohama, and Kobe and a number of other cities across Japan. Speaker 16: The greatest surprise raid in the history of aerial warfare. PeterLang-Stant: Now, they didn't do a lot of damage physically. Ross Coen: But it was such a shock to the Japanese, to think that their homeland could be invaded, that these planes could actually fly over the Imperial Palace, the home of the Emperor, and it could not go unchallenged. Robert Krulwich: Doolittle went over the palace? I didn't realize that. Robert Krulwich: He went all the way downtown in Tokyo. Ross Coen: Oh yeah, right over the city. And so immediately after the Doolittle raid, an order went out, it was just, "Find a way to bomb America." Nick Farago: Now, Japan's Navy is stretched so thin at this point in the war there's no way they pull off something like the Doolittle raid. PeterLang-Stant: They didn't have aircraft careers that could get their planes close enough to the U.S. mainland. Ross Coen: Today we call this the jet stream. That name didn't come along until after the war. PeterLang-Stant: At that point we barely knew about the jet stream. Ross Coen: But prior to, and during the war, the Japanese did extensive research into these winds. Nick Farago: Okay, so in 1924 there's this meteorologist named Wasuboro Ishi, and he goes to the top of a mountain and he releases a bunch of these little paper weather balloons, and he discovers that at about 30 thousand feet up there's this river of fast moving air. Speeds up to 175 miles an hour, carrying anything in it's midst. Pollen, insects, all the way to North America within days. Ross Coen: Push these balloons across the pacific ocean. Speaker 17: [Foreign Language 00:13:11]. Nick Farago: So this is Tetsko Tenaka. She was interviewed in this independent documentary called On Paper Wings. Speaker 17: [Foreign Language 00:13:20]. Nick Farago: In 1944 she says she was a teenager when the Japanese military came to her school and basically turned it into a factory. Speaker 17: [Foreign Language 00:13:28]. Maho Shina: Washi, hand made Japanese traditional paper. Nick Farago: This is Maho Shina, who now works at the Noborito Institute in Japan. Maho Shina: Huge amount of paper was required. Nick Farago: Maho says that girls would work 12 hour days making thousands, tens of thousands of these sheets and gluing them together. Robert Krulwich: Why didn't they have adults in the factories? They were all fighting the war, or what? Maho Shina: The adult had, if they're good, for the hydrogen bombs. Nick Farago: The girls had a certain dexterity for the paper making? PeterLang-Stant: The nimble fingers, I think I read that somewhere. Nick Farago: And after they finished producing the balloons, and after the balloons were strapped with bombs, they were shipped off to those beaches and just let go. PeterLang-Stant: People from the Japanese side watching them take off said they looked like huge jellyfish swimming through a pale blue sky. Ross Coen: These perfectly silent vehicles, the only sound was the rustling of the paper as they took off. Robert Krulwich: How many were launched? Ross Coen: From November 1944 to April 1945 they launched 9,000 balloons. Ross Coen: Now, the engineers in Japan who designed this faced a very serious problem. PeterLang-Stant: They're floating at speeds from 50 to 100 miles an hour. Ross Coen: Temperatures are going to fall to -40 centigrade, and the fixed volume of hydrogen inside that envelope is going to contract, the balloon is going to lose altitude, drop out of the jet stream, and down into the ocean all together. Nick Farago: So to solve this, says Ross, what they did was this. They took 32 sand bags, hung them on the balloon, and then connected those sandbags to an altimeter. Nick Farago: Trigger a fuse. PeterLang-Stant: Which cuts off one of those sandbags, and drops it into the ocean. Ross Coen: And now, the vehicle will re ascend back into the jet stream. Robert Krulwich: Because it's lighter. Ross Coen: Because it's lighter. Nick Farago: So these balloons they're riding the jet stream and then every night they start to descend, but then off would go a sand bag, and they'd go back up. And whenever they'd cooled off enough to drop, same thing. Drop, then rise, drop then rise, over and over, 32 times until every sandbag was gone. Ross Coen: Once all of the sandbags have been dropped, now you have only the bombs remaining, and the bombs are held in place with the exact same mechanism as the sandbags, and now by the very same system the bombs are the last to go. And presumably the balloon is now somewhere over North America. Robert Krulwich: Oh I see. So it's a sandbag countdown. 30, 29, 28, 4, 3, 2, 1 I hope I'm in Oregon. PeterLang-Stant: And when it was in Oregon, or wherever, the idea was that it would drop it's last bomb, float away, and basically self destruct. Ross Coen: They, I guess, figured it would be more terrifying to have bombs raining down silently from above with no calling card at all, than with a Japanese calling card. Speaker 16: And as the last sandbag is dropped, now only the central payload is left. Nick Farago: This is audio from a declassified Navy instructional video made about these balloon bombs in 1945. Speaker 16: In the event one of these units is found do these two things to render it harmless. Nick Farago: It explains to soldiers how to ... what to do if they find one of these bombs, and how to defuse the bomb. But I think the most interesting thing about the video is this text that's written in huge block letters right at the bottom of the screen. It says, "Do not aid the enemy by publishing, or broadcasting, or discussing information." Mike Sweeney: Information can be a powerful tool. It can be a powerful tool for good, and a powerful tool for evil. Nick Farago: This is professor Mike Sweeney. Mike Sweeney: And I'm a historian of war time censorship. Mike Sweeney: There are a few stories that appear in the local newspapers in the far west. Stories about a Japanese attack on the mainland of the United States. Nick Farago: Time and Newsweek even picked it up. Mike Sweeney: Saying, we're not sure what these are but, you know, are these the Japanese spies coming in on these balloons. Nick Farago: Is this a large scale attack? Mike Sweeney: What is going on? Nick Farago: And then very shortly thereafter. PeterLang-Stant: Just three days after those Time and Newsweek articles. Nick Farago: The office of censorship initiated a press blackout. Mike Sweeney: This blackout on news. PeterLang-Stant: They sent out memos and telegraphs to all the major wire services. Nick Farago: Keep any news of these Japanese balloons off the wires and out of print. Mike Sweeney: Any stories about these bombs will have to be approved by the appropriate authority of the U.S. Army if you wish to publish or broadcast news about them. Jad Abumrad: And why would they want to keep this secret? Mike Sweeney: So the governments ideas about why balloon bombs should be censored, in particular the Army's ideas, were number one to avoid panic. Nick Farago: These things are instruments of terror, right? You can't be afraid of something you don't know exists. Mike Sweeney: Number two, is avoid helping Japan. It was thought then that if we printed exact coordinates of particular bomb landings that this would help Japan better target the bombs. Jad Abumrad: And what did the reporters think about this? Mike Sweeney: They grubbled sometimes, but they complied. Mike Sweeney: Yep. Everyone in the news industry was as patriotic as the rest of the country that is the vast majority of journalists supported the war. Now of course, if you screwed up and you sent out a story that got American lives killed you could be prosecuted under the Espionage Act. Furthermore, can you imagine what your listeners would do if you were the radio station identified as killing 100 American sailors? Nick Farago: So the newspapers and radio stations kept their mouths shut, which meant that most Americans never even heard this was happening, and more importantly, the Japanese weren't really hearing about whether their bombs made it or not. So they probably concluded that it was basically a failed experiment, which largely it was. Of the 9,000 released virtually none caused any damage, and certainly not any terror. Except ... for this one balloon. Jad Abumrad: That's coming up. Will: Hi this is Will calling from North Umberland, England. Radiolab is supported in part by the Alfred P Sloan Foundation, enhancing public understanding of science and technology in the modern world. More information about Sloan at www.sloan.org. Jad Abumrad: Hey I'm Jad Abumrad. Jad Abumrad: This is Radiolab. We continue now with our story from reports Peter Lang-Stant and Nick Farago about the 9,000 or so balloon bombs Japan sent to America in 1944 and '45. That rained down on American soil and created nothing really, nothing happened. No damage, no terror, nothing. Nick Farago: But then we get to this tiny little town called Blye. Cora Conner: To me, there's no place like old Blye. Nick Farago: Blye is this sleepy little logging town at the base Gearheart mountain, in south central Oregon. Cora Conner: There's a lot of pretty scenery. Nick Farago: And Cora Conner, who you just heard, was born and raised there. Cora Conner: You know everybody, and they're just like a big family out there. Nick Farago: In the '40s when Cora was a young girl there were about 700 people living there. Cora Conner: Yeah, but we did all kinds of fun things. We had a fish fry up at Dog Lake. Huge catfish fry up there, the whole town stayed all night, went back home the next day. In the winter the canals would freeze over and we had bonfire and ice skating parties, and it was a fun place to live. Nick Farago: Can you tell me about the morning, was it a Sunday? Cora Conner: Let's see, what happened? I'm trying to think. Saturday I think. May fifth is all I can remember. Yep, that was May fifth. Nick Farago: May 5, 1945. Cora Conner: It was a beautiful day. The sun was shining bright. Cora Conner: Knew them very well. Sunday school, I went to church occasionally up there. Cora Conner: We called him Dicky. He had a crush on my sister who was a little younger than me, and they wanted her to come on this picnic so they came by and stopped the Pastor and his wife stopped, and the kids all piled out. Nick Farago: They stopped before they went up? Cora Conner: Yeah, trying to convince my mom to let my sister go, or both of us, or whatever, but mom didn't want us to go because Saturday was our chore day, and my day to work the switchboard which usually made me pretty angry. That was my job, and she said, "No, no way." Well, my sister didn't really want to go because she really wasn't encouraging this relationship too much. Cora Conner: Yeah, Dickey, yeah. Nick Farago: She didn't want to lead him on? Ross Coen: And they drove up to Gearheart mountain. Nick Farago: A couple miles up a logging road they pass some Forest Service guys working on the road. They go a little further, to where the road comes near a creek. Ross Coen: And Archie pulled the car around, and parked. The kids jumped out of the car, and started running down toward the creek. Elsie, who was pregnant, as I mentioned, and she was feeling a bit car sick. She jumped out to get some fresh air, and to chase after the kids while Archie went around to the trunk of the car to get out the fishing poles and the picnic baskets et cetera. One of the children, saw something on the ground, a large canvas white, gray balloon of some kind spread out on the ground. Called to the other children to come have a look. The children, and Elsie apparently gathered in a tight circle around the balloon. Archie later reported that while he was getting the picnic basket out of the trunk his wife called to him, "Honey come look at what we found." He turned and just took a few steps toward them, and at that moment ... We'll never know exactly what happened, but apparently one of the children reached down to pick up the device, the bomb detonated. All five children, and Elsie Mitchell were killed instantly. Nick Farago: The Forest Service guys down the road were close enough to hear the blast. Ross Coen: They come running when they hear the explosion, and they see Archie Mitchell has run to the site and his wife's clothes were ablaze, and Archie was kneeling over his prostrate wife beating out the fire with his bare hands. Nick Farago: There's no wind. On our last day in Blye we went to visit the site where the bomb went off. It's in the middle of nowhere. It's just a chain ... It's this little fenced off area, like a little pen. And there are these tall pine trees. It's just huge cuts in the tree. Jad Abumrad: Those are shrapnel cuts in the tree? Yeah they still ... This has not healed. Erie place. Cora Conner: Of course I didn't know. Just wanted to know what was going on. Cora Conner: The guy that was working up there for the Forest Service come rushing in to the telephone office, and I mean he was scared. Pure white and scared, and I thought my God what's going on? What's happening? He came in and made the call to Lakeview. Nick Farago: The Naval base in Lakeview, and about a half an hour later this big imposing military guy comes in. Cora Conner: He was all metals and all his full uniform, you know. He must have made it, it seemed like, in the blink of an eye. I thought, my God what has happened, and then when he talked over the phone I knew what was going on. He said they'd had a bomb explode up there with casualties, and then he talked to me. He said, you not talk to anybody about anything that you've heard here. Not your mother, not anybody. He says now you're not to leave this office. By then I was just jelly I was so terrified. Nick Farago: He leaves, and the word is trickling around, spreading, around town. Cora Conner: They knew something had gone wrong, and they gathered at the phone office because the phone office knows everything in the whole valley, and they knew I knew what was going on. That's when it all hit. Nick Farago: Pretty soon there was a crowd outside. Cora Conner: Screaming and yelling at me. Cora Conner: Yeah. We know you know what's going on. You better come out and tell us. We're coming in there and you're going to tell us what's happened. Nick Farago: So these people are your neighbors and things like that? Nick Farago: That know you, and they're saying that? Nick Farago: Dicky's father, Dicky was the boy who had a crush on Cora's sister. Cora Conner: I can tell you exactly how he has dressed that day. He had on a red and black checkered hunting shirt, and his red hunting cap. Nick Farago: At the time all he knew was that his son was missing. Cora Conner: He stood out there and he shook his fist and he yelled, and he scared me half the death, threatening to come in and all that. He says, "You know what's happening. Let us know what's happening," and I couldn't do anything. I sat there, all day. Nick Farago: How old were you? Cora Conner: 16. It really, really tore me apart. I was just in a complete fog for days. I never talked too much about it. Nick Farago: Within a day or so, the military told most of the town what actually happened that day. Cora Conner: And then a short time after that a big Army truck ... Well, there was two big Army trucks, and they stopped right out in front of our house. We wondered what was going on, you know. Your little town like that, anything different everybody goes to the window and takes a look. Here come ... Okay, this is awfully hard for me. A woman and a little kid jumped out of the back of that truck. She was Japanese. They were on their way to the Tulle Lake. Nick Farago: The Japanese interment camp nearby. Cora Conner: And she's screaming and crying, and praying. Please we need water. We need water. It was hot. It was really hot that day, and they were in a canvas covered truck, jammed in there. I grabbed a pitcher, a bucket, or whatever was there in the kitchen, filled it with water, and started out the door. By that time they were throwing rocks at that lady and her kid. People in that town were so terribly upset, and they were throwing rocks at her, and mom wouldn't let me go, and I screamed and cried at my mother because she wouldn't let me go. She says, "You can't go out there. They'll throw rocks at you. I won't let you go." To this day, that picture is in my mind, and I've prayed to the Lord to forgive the people that were doing that, and to try to ... I can't accept it. There's no nothing can make me accept what happened. I thought that was the most horrible thing in the world people could do. A woman and child, they had nothing to do with the bomb, nothing to do with the war, nothing. Cora Conner: It's still hard. How can people be that way? It upset me so horribly bad. I didn't want to talk about it. I couldn't talk for 40 years. Jad Abumrad: It's weird. It's a kind of weird scary symmetry to this whole thing, like the Japanese military was trying to create terror, right? Jad Abumrad: Like what they felt after Doolittle, and so they wanted to make this situation where bombs were falling silently from the sky. We couldn't even tell where they were coming from, almost like the gods were dropping them. But we kept it quiet, so nobody panicked. Except, by not saying anything, at least in this one small instance, it created exactly the situation that the Japanese military wanted. I mean not on the scale that they wanted, but in its effect. It's like a concentrated version of the thing that they were trying to create. Jad Abumrad: ... the problem. Robert Krulwich: ... that's not a problem. Five is a sacrifice in war. What is it, five, six people. Robert Krulwich: There were 125 million people in America then. Jad Abumrad: Hmm. I think there actually might have been a little bit more than that. Robert Krulwich: Well you can see what it would have been like listening to this story. You can see what it would have been like if this story had been well known, and had been told from person to person. If everybody was looking up and wondering where the next strange thing was coming from. Jad Abumrad: Well they wouldn't, there might have been panic, but those kids wouldn't have tugged on the balloon. Robert Krulwich: That's the choice. Jad Abumrad: Because they would have known, yeah. Andy Mills: Hey I'm sorry to jump in here I just know that we don't have Ross much longer, and I want to respect your time. Jad Abumrad: This is our producer Andy Mills, who worked with Nick and Peter on this story. Andy Mills: Before they kick you out, the only last question that I kind of had on my list is why is it that we don't know about this? I've never heard of this before. I don't know if Robert, if you've heard of this before. Andy Mills: Why the hell is this not a thing we know? Ross Coen: I think it's directly an outgrowth of that censorship policy. At the end of the war, the war department destroyed all of the evidence. They didn't want any evidence of these balloons just out there in general circulation. Ross Coen: This is one of those footnotes to the war that at the end of the war just never ... People forgot about something that they didn't know about anyway. Andy Mills: Ross, are there any more out there? Ross Coen: That is a very interesting question. It's estimated by the war department that of the 9,000 released they thought that maybe seven to 10& of the total would have survived the trans-oceanic crossing and arrived in North America. That's 900. 300 are confirmed as having arrive in North America. So that means there are dozens, perhaps hundreds, that arrived in North America, but were never accounted for. In the 10 or 12 years immediately after the end of World War II a couple dozen of these things were found. Several in Oregon in 1948. One in Alaska in 1955. One in Idaho in the early 1960s, and then the recoveries stopped. Robert Krulwich: Were they live like the one in Oregon? If you touch them would they blow up? Ross Coen: Some of them were. Ross Coen: Some of them were. Now heres the fascinating part. Last October, October of 2014, I kid you not. Brad Simlinger: Dave was ahead of me, and he stopped and said, "I think I saw the bomb." Brad Simlinger: Yeah my name's Brad Simlinger. Dave Bridgeman: My name's Dave Bridgman. Ross Coen: In Lumby, British Colombia who are doing some survey work. Dave Bridgeman: You know, this is the middle of nowhere. Ross Coen: Found the remnants of a Japanese balloon that had been on the ground for 70 years. Dave Bridgeman: And we definitely worked in remote areas, and in general we don't see much except trees and rocks, but there are those odd special days where you see things that no one else gets to see. Ross Coen: This happened just a few months ago. I tell you, if you're hiking, if you're out in the woods in the pacific north west watch where you step. By the way Fugo that's the codename in Japan for these weapons. They were called Fugo, F-U-G-O. Jad Abumrad: It's also the name of Ross Coen's book. Ross Coen: The curious history of Japan's balloon bomb attack on America. Robert Krulwich: Thank you to Peter Lang-Stanton, and to Nick Farago for their reporting, and extensive reporting of this. Andy Mills: Yeah, big thanks to them. Big thanks to them. Also thanks to Elena Sole who's documentary On Paper Wings was a big source for us. You heard those Japanese voices in the middle of the story that came from her documentary. Also, we have original music this hour from a couple of folks, Jeff Taylor, Michael Manning, David Wingo, Justin Walter. Jad Abumrad: We had production support from Andy Mills and Damiano Marquetti. Andy Mills: And if you want to see these balloon bombs we have some incredible pictures on our website radiolab.org. Jad Abumrad: I'm Jad Abumrad. Jad Abumrad: Thanks for listening. Whoa, what was that? Robert Krulwich: There was like a ... Did you hear a burble? Jad Abumrad: Was that you? Robert Krulwich: I don't think so. Jad Abumrad: ... bird or something. Jad Abumrad: Is that Soren showing up? Robert Krulwich: I don't know. Speaker 25: This is Terry Babcock-Lumage from West Point, New York. Radiolab is supported by Upstart. If you had a list of topics nobody likes talking about, debt would be at the top, but hiding won't make it go away. Now Upstart is revolutionizing the way you borrow money by rewarding you for your job experience, and education in the form of a smarter interest rate. Over 200,000 people have used Upstart to pay off credit cards, student loans, fund their wedding, or to make a large purchase. See why Upstart is ranked number one in their category with over 300 businesses on Trust Pilot, and hurry to upstart.com/radiolab to find out how low your upstart rate is. Checking your rate only takes two minutes, and won't affect your credit. That's upstart.com/radiolab.